Mine: Tons of twists and turns make the a edge of the seat thriller. Who are the good guys? Hard to tell. Very enjoyable. 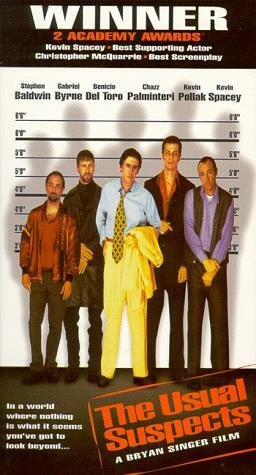 Leonard Maltin/Plot synopsis: Five criminals of slightly different stripes are busted and put in a police lineup for a crime they didn't commit. They soon discover that fate--and perhaps more earthly forces--brought them together. Terrific cast makes the most of Christopher McQuarrie's intriguing, Oscar-winning, but convoluted script. (If you think about it, the final twist negates the entire film!) Highly praised, but to our minds, too ``clever'' for its own good. Spacey won an Oscar as Best Supporting Actor. Super 35. (out of 5 stars) Absolutely, unequivocally the best film of all time. You simply do not get better than this. I was literally screaming at the TV at the end. Go see it if you have not, as you're life is simply not complete until you see this movie. (out of 5 stars) A CLASSIC Its not to clever for its won good-I'm 13 and i understood it! And btw thats the point, the twist is meant 2 negate all of Kints confessions leavin the possibility of him being Keyser Soze, he read it of the board remebr?